We welcome visitors at our flying sites. However, please be advised that the Landowners’ permission to fly at these sites is limited to members of the Southern Ontario Glider Group, and to our accompanied guests. To make arrangements to fly as our guest, please Contact us beforehand. Thank you, and we look forward to your visit ! SOGGI thanks Green Horizons and sod farm owners for their support over the years in allowing SOGGI to fly on their fields. It’s a nice day. The sun warms the countryside unevenly, creating point-to-point temperature variations. These temperature variations create 3 dimensional air circulation patterns that include areas of rising air (“Thermal Lift”). The pilot’s task is to fly the model sailplane into that “Lift”, so that the model will be drawn upwards by the Lift. This ability to climb without an engine is called “Soaring”. Sometimes lift is scarce, so a protracted search for lift may be required. The spectacular ability to glide for great distances and for long periods of time is the defining characteristic of a good model sailplane. But if there is no Lift, then even the best sailplane will be forced to glide back home for an early landing. Usually, lift is encountered within the first few attempts and half-hour soaring flights are relatively common. The pilot must be able to see the model clearly in order to steer it, and this is what defines his flight path’s boundaries. A repetitive zig-zag search followed by circling in lift can add up to a distance of many miles, all occurring within the area visible to the pilot. Before any search for lift can begin, the model must first be launched to an initial altitude of several hundred feet. For “pure” sailplanes, the launch effort is normally provided by an electric winch, or by a rubber bungee cord (more properly called a “Hi-start”). This launching tackle must be laid out on the ground parallel to the prevailing wind direction, so that the launch can be made squarely into the wind. Moments before launch, a helper ducks under the wing, having just connected the launch line to the sailplane. The Pilot strains against the hi-start’s pull. Launch altitude is reached within a few seconds, at which point the aircraft is released from the launch line. The sailplane’s search for lift then begins. After the launch-line drops to the ground, helpers retrieve the line to prepare for the next launch, and to prevent entanglement with the launch lines of other nearby winches. Sod farms provide a large flat area that is free of obstructions, making it easy to lay out the launching tackle and to retrieve the launch lines. And just in case you are caught far from home and struggling for altitude, it’s comforting to know that you can land nearly anywhere on a sod farm. Sod farms can also accommodate some other soaring aircraft types, for example those with on-board electric propulsion systems, discus launch sailplanes, or even rubber powered freeflight models. “Freeflights” have no radio control system, but simply drift downwind while circling continuously. Even without an interactive means of control, they can still land safely on our large unobstructed flying sites. Click on Our Model Aircraft for more details concerning SOGGI’s various aircraft types and their launching methods. Permanent markings and/or physical infrastructure are not permitted on the sod surface. Other techniques for organizing our field operations have therefore been developed. Considerations that go into the day-to-day set-up of our field operations are discussed on our Safety page. On July 12, 1985, Jack Nunn of Midhurst Ontario flew 2 hrs 47 minutes at the Central Ontario Glider Group’s sod-farm flying site near Cookestown, Ontario, to set the current Canadian Open Thermal Duration Record for all sailplane classes. In the 3 decades following Jack’s achievement, model sailplane design methods and construction materials have made spectacular advances, as have our radio control systems. The time would now seem ripe for someone to challenge the Canadian record. Strong winds tends to disperse thermal lift, and this can make sod farm soaring impractical until calmer air returns. Luckily, thermal lift is not the only type of lift available. SOGGI also maintains a Slope Soaring flying site. of the hill, because there the air goes downwards. 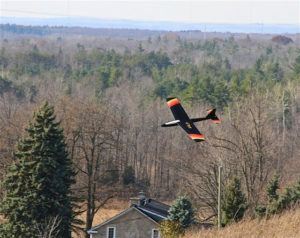 SOGGI leases this slope flying site from the Hamilton Conservation Authority. Landings can be a bit tricky, and slope soarers are normally constructed to withstand some abuse. On a windy day, slope lift is typically concentrated and relatively uninterrupted. Given the right airplane, a skilled pilot can execute complex aerobatic maneuvers and/or have long-duration flights on the slope. 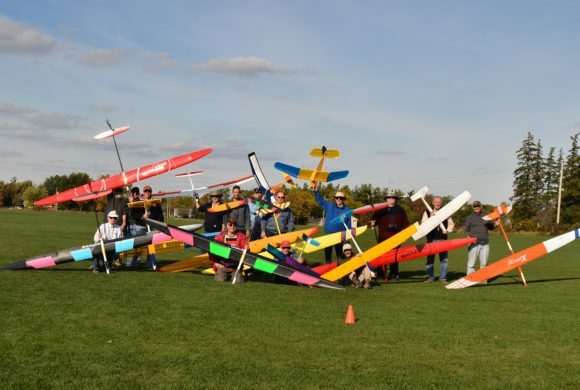 FACT #1: The Canadian Absolute Duration Record for ALL types of R/C Sailplanes, is currently held by a slope soarer. On August 4, 1986, Robin Galway of Ottawa flew non-stop for 8 hours 47 minutes at a slope site near Montreal, edging out the previous record of 8 hrs 15 minutes set by SOGGI’s Stan Shaw in 1986. FACT #2: The current World’s Absolute Speed Record for ALL model airplane types is held by a highly specialized R/C slope soarer flown by American, Spencer Lisenby. Using a cyclical looping maneuver known as “dynamic soaring” it reached 545 mph (877 kph) on June 9, 2018 at Bird Springs Pass, California. (The world’s fastest jet turbine powered model aircraft reached 770 kph on Aug 21, 2017). SOGGI’s modest slope site is unsuitable for attempting dynamic soaring records, but it is ideal for gentle fun flying.